The region below and under the cover of the body of the mandible is called submandibular region. It stretches upwards up to the mylohyoid line and below up to the hyoid bone. It contains both submandibular and submental triangles superficially. The deep structures in this region contain floor of the mouth and the root of the tongue. Because it’s the common site for swellings because of enlargement of submandibular lymph nodes and submandibular salivary gland, medically this region is really essential. The generalized swelling of the region is caused due to inflammatory edema of the floor of the mouth (named Ludwig’s angina) distributes in this region. As it supplies the impression the submandibular region addresses the structures below the mandible only, the term submandibular generally misleads people. The submandibular region is crossed superficially by platysma in the superficial fascia. 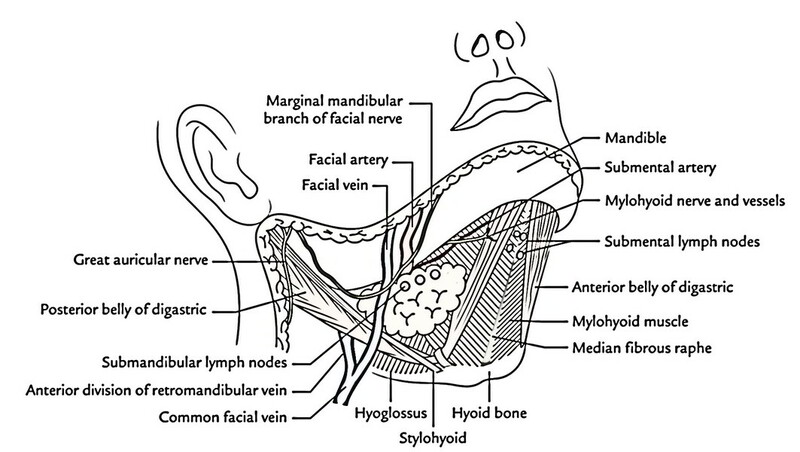 Deep to platysma, the marginal mandibular nerve (lowest branch of facial nerve) crosses the lower border of the mandible near the angle and runs below it across the submandibular region before turning upwards to get to the mental region of the face where itsupplies depressors of the lower lip (depressor labii inferioris, depressor anguli oris) and mentalis muscle. The surgical incisions are, consequently, not made along the lower border of the mandible to prevent injury to this nerve. The great auricular nerve crosses the posterior belly of digastric on its way to supply the skin of face and auricle. Suprahyoid muscles (all matched), viz. digastric, stylohyoid, mylohyoid and geniohyoid. Extrinsic muscles of the tongue (all coupled), viz. hyoglossus, styloglossus and genioglossus. Submandibular and sublingual salivary glands. Lingual, hypoglossal and glossopharyngeal nerves. It’s significant to understand that on either side of midline, the submandibular salivary gland is the most notable structure and the hyoglossus muscle is the key muscle of the submandibular region.